When you think of Scotland, you automatically think of rugged mountains; red and purple moss; lonely lochs; cobble beaches and possibly unpredictable rainy weather. Now imagine all of that, packaged up, and put onto one Island: and you’ll have the Isle of Skye. The Isle of Skye is Scotland’s biggest island, roughly 50 miles long. Apparently its name comes from the old Norse word – ‘sky-a’, meaning ‘cloud island’, which I think summarises the place quite nicely. Clouds, mist and fog hang over this pretty island, covering its most famous mountains, the Cuillen range, throughout most of the day. It has a dreamy feel to it and is nothing short of magical. After the longest drive of my life (I know that anyone from America or Australia will think this isn’t a long journey) but 10 hours in a car, with a very excited dog, was pretty endless. Once we got to Skye, we also had no phone signal, the weather was rainy and blowing a gale, and there were some fairly tense conversations going on regarding directions. But once we made it to where we were staying, all was forgotten as this place was beautiful! 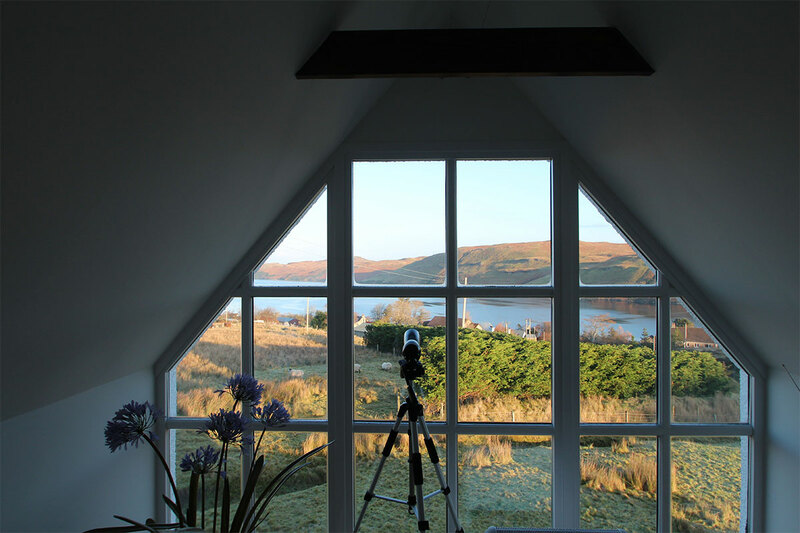 A converted chapel, we had panoramic views over Loch Harport, complete with a bath tub overlooking the mountains and a sauna! The next day we set about organising what we were going to do and decided to firstly visit the Quiraing. 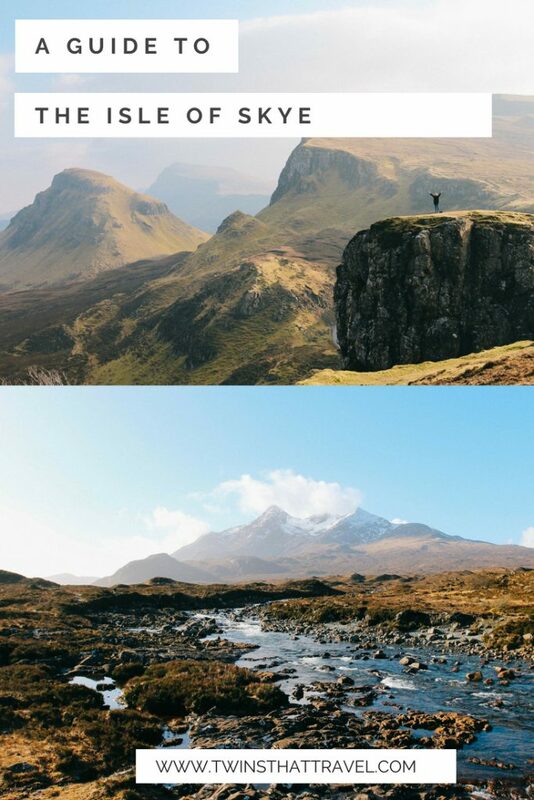 Our guide book described this as Skye’s ‘most remarkable scenery’ and it definitely didn’t disappoint. 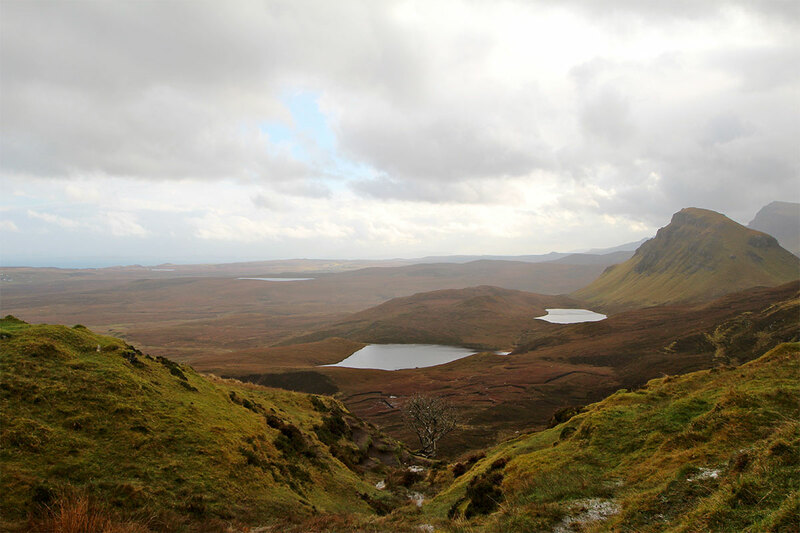 After a few thousand years of slipping cliffs and an ice age, the Quiraing is made up of huge jagged pinnacles, sunken lakes and rocky mountains. We spent three hours exploring the area (the dog was going insane with excitement) and it was breathtakingly beautiful. A definite must see for anyone visiting Skye. We were up bright and early the next morning for more adventures. The weather was amazing so I (Laura) thought I would nip out quickly to do some early morning photography. I saw a mossy hill and decided, for reasons unknown to me, that I should definitely climb it. However, what I thought was a mossy hill was some sort of bog – a really boggy bog. I sunk quite quickly to my shins and I won’t lie, thought I was about to meet my death on the hills of Skye. I went into panic mode within about 5 seconds and grabbed madly at the bush next to me. I might even have cried. After 10 minutes hours, I freed myself and trudged back home, soaking wet but trying to style it out as locals drove past. So a word of warning – don’t trust any soft looking hills in Skye. After the near death experience, we then explored two places I was desperate to visit: Fairy Glen and the Fairy Pools. 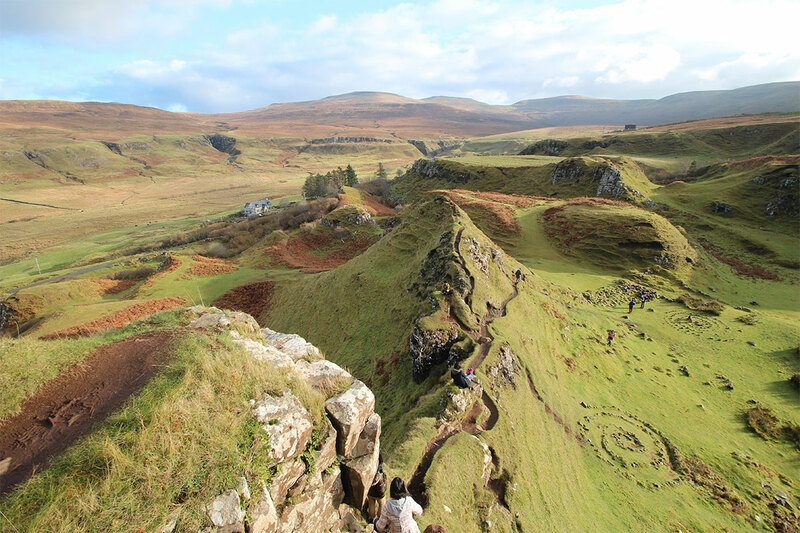 Just south of Uig, the Fairy Glen is a surreal place. It’s almost like a miniature Machu Picchu. Full of miniature hills, pinnacles, tumble down cottages, little trees, and small streams, it’s a little bit like someone took Skye’s landscape and shrunk it. It’s amazing! It reminded me of a film set from The Hobbit and we spent a good three hours there. In full fairy swing, we then headed to the fairy pools, close to Carbost. Backing onto Skye’s enormous Cuillen mountain range, the fairy pools are the product of an enormous waterfall, which you can follow for an hour or so. Each pool is made up of crystal clear water and surrounded by purple moss and flowers. At the top, there are some bigger plunge pools, which you can swim in during the summer. Like all of Skye, it was beautiful! This blog post will never do Skye justice. It’s an insanely beautiful place: quiet; peaceful; serene and other-wordly. Scattered with bizarre but beautiful landscape, pubs (we ate a LOT) and with the smell of wood smoke always in the air, Skye is now firmly in my top three destinations. It was well worth the never-ending drive there and even worth the dog throwing up on me after one bendy road too many. So my advice? Get to Skye! 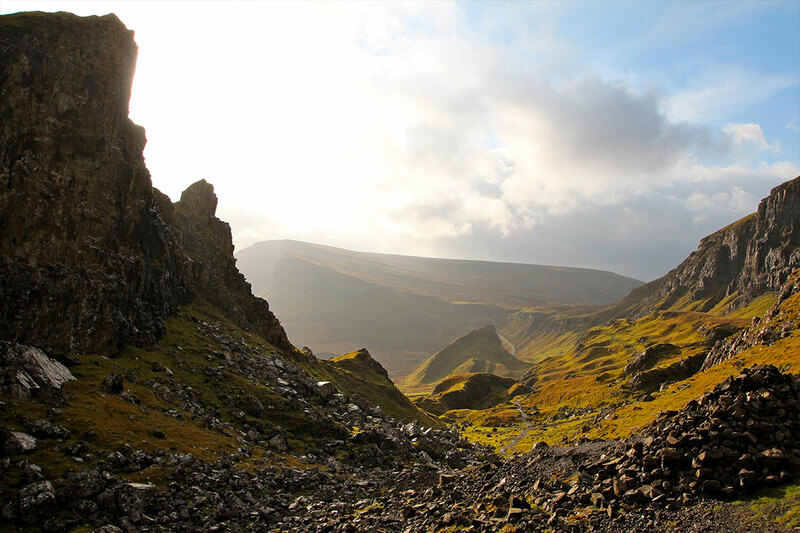 Read our other two blog posts on Skye here: Exploring the Isle of Skye by Boat and Searching for Fairies on the Isle of Skye. 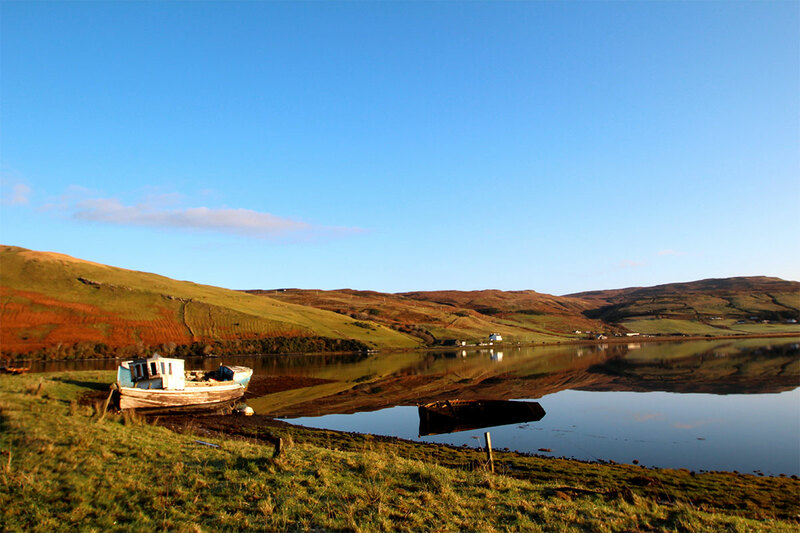 Where to stay: we would highly recommend the Cullin Hills Hotel in Portree, where we stayed on our second visit to the island. I’ve been there and I agree, it’s a gorgeous destination! Been there as well! This place is too awesome. definitely going to have a second visit. Been there as well! the place was too awesome that one visit is not going to be enough. Ah this looks beautiful! Definitely haven’t heard enough about this place! I need to visit! i was in Skye at the very start of the year. your photos of it are gorgeous! Identical twin here…heading to Skye in June 2017. Question…what is the name of the place you stayed?? I love this post. Thank you for the tips, we’re heading there in a few weeks and will certainly keep this post in mind during our planning!